It’s a good day to drive with the top down. Is there any better phrase that could be uttered to describe a perfect day? For those who live in temperate climates, this phrase may mean very little to you. When you drive with the top down 360 days out of the year, having it up is probably a nicer change. However, for those who get to endure the winter blizzards, followed by the spring rains, then the summer thunderstorms, all topped off with fall hail, a day with the top down is a slice of paradise. But no matter where you live, if you want to drive with the top down, you’ll want to be driving one of the best convertibles of the 2011 model year, found by research at Car and Driver, Consumer Reports, Edmunds, and Motor Trend. If you’re thinking we’ve committed a typo and accidentally placed a luxury vehicle in the sports option spot, sorry, but we did that on purpose. Yes, the M3 is from luxury manufacturer BMW. Yes, it’s still a luxurious automobile. But it also gets to 60 mph from a dead stop in just 4.8 seconds with its 4.0L V8 engine. The 2011 model is the heaviest of all the M3 versions, but it also delivers the best driving experience. The electric power steering and balanced chassis make the driver feel like a part of the vehicle. It’s definitely on the higher end of the price scale though. 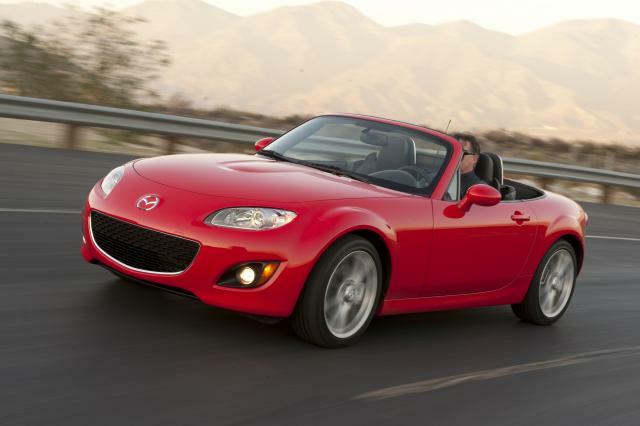 “The 2011 Mazda Miata maintains its position as one of the all-time great roadsters, mixing refinement and excitement in an affordable, compact package.” (www.edmunds.com) That seems to be the sentiment across the board for the Miata. Its precise steering and handling make it a true pleasure to drive. It’s not exactly made for bigger drivers, and it won’t blow the doors off anything, but with the top down (it comes available in hard or soft-top) and the engine revving, the Miata is a driving pleasure. It’s one big drawback is a serious lack of trunk space. It is a bit pricy for what is supposed to be an “entry-level” luxury sedan, but the 3 Series definitely sits atop the list as the best. The 328i possesses a naturally-aspirated inline-6-cylinder engine which may be one of the smoothest engines from start to finish ever. The convertible in any of the style choices comes with available heat reflective leather seats, which do a nice job of staying cool while sitting for long hours in the burning sun. As always, BMW luxury comes standard. Get the A5 convertible with the Sport seats and you’ll need to drive pretty fast with the top down to keep from falling asleep in them. There’ll be no such problems in the back seat, as it remains rather cramped, but everything within the soft-touch cabin is both luxurious and well-appointed. The A5 handles very well for its size, but it looks like the variable-ratio steering system is a pricy option that should be left off the list. Its fuel efficiency of 21/31 mpg is one of the best in this class. 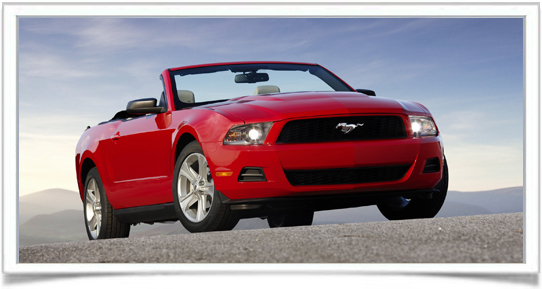 It doesn’t matter if you’re a fan of sports cars, muscle cars, luxury cars, or economy cars, if you like convertibles, you’ll love the Mustang. It has a little bit of it all. The base 3.7L V6 is powerful enough to be beyond sporty. Its sleek, retro style is a nostalgist’s dream, and it possesses enough technological wizardry and comfort to appease even luxury buffs. The convertible is a four-seater with the top up or down, but the rear seat can be a bit tight for a full-grown adult.